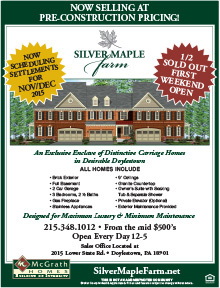 New Homes in Bucks County. Quality Residential Construction. James Court has a convenient historic Bucks County location. Minutes from I-95, the Pennsylvania Turnpike, Route One, and the New Jersey bridges, these Carriage Homes offer unparalleled convenience to destinations throughout the region and beyond. Close to everything, yet sheltered from traffic and noise, the community is beautifully landscaped and on quiet streets. Offering four unique home designs and carefree living for all ages, St. James Court is perfect for expanding families, move up buyers, and those preferring a first or second floor owner’s suite. Standard amenities in every home include full basement, 2-car garage, three bedrooms, two and half baths, and granite countertops. Designed for maximum luxury and minimum maintenance, St. James Court provides professional landscaping and lawn care, as well as snow removal to all residents. You'll appreciate the convenience of having so much to do - so close to home. St. James Court is within walking distance to the fabulous Shoppes at Flowers Mill, and just a short drive from the Oxford Valley Mall, Quaker Bridge Mall, Neshaminy Mall, art galleries, antique shops and fine dining. The region's historic sites, golf courses, charming river towns, and many parks and natural areas offer richly varied sources of recreation and amusement.